Lemon-garlic chicken is a simple and classic dish, but many recipes today involve bread crumbs. 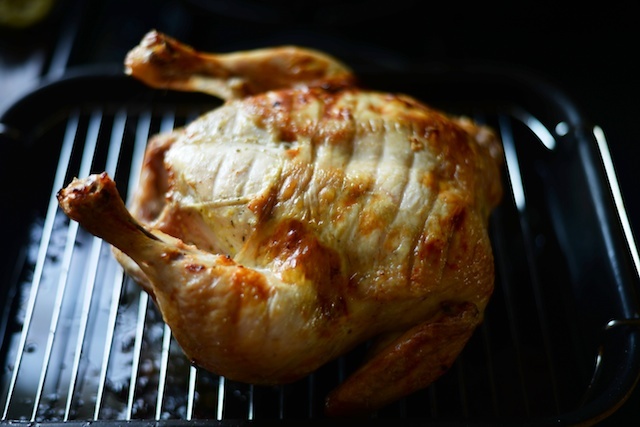 This is a simplified, paleo-friendly version that results in a golden and juicy roast bird. When I was a little girl, my dad always roasted the chicken with the breast down for the first half of it’s total cook time. He said that doing so would help prevent the breast from getting too dry. I never questioned his logic, nor did I ever pay attention to how pretty or ugly the bird came out. All I cared about was whether it was tasty or not, and it usually was. So, while preparing to make this lemon-garlic chicken recipe, I decided I would give Dad’s way a try. I’ll admit, this bird won’t make it to the cover of Better Homes and Gardens or Paleo Mag. But it was juicy and full of subtle lemon and garlic flavors. Massage the seasonings mixture under the chicken skin all over the meat of the bird. Some of the seasonings mixture will stick to your hands; so rub the outside of the bird before washing up. This will allow some of the flavors to get on the outside of the skin, too. Roast breast-side down for 35 minutes on a wire rack-lined baking pan. Then, flip and roast another 20 minutes. Lastly, turn up the oven heat to 400° F for 10 – 15 minutes, or until the chicken reaches an internal temperature of 160° F.
We served this lemon-garlic chicken with grilled asparagus, but it would be great with any vegetable on the side. While it’s not the prettiest roast bird you’ll ever make, we think you’ll enjoy this juicy lemon-garlic chicken!